Please be aware that when you purchase at the tax sale, you are purchasing taxes, NOT PROPERTY. Purchasing taxes is a complex legal procedure. It is advised that you contact an attorney, and/or review the Illinois Compiled Statutes prior to participating in a tax sale. 1. When will your next tax sale be held? The delinquent tax sale will be held on Monday, October 28, 2019. It is held at the DeKalb County Administration Building-Conference Room East, 110 E. Sycamore Street, Sycamore, IL 60178 at 9:00 a.m.
We advertise in the local newspapers after all second installment payments are posted. Lists are available for a $75.00 prepaid fee. You may send your payment at any time. We will then send you a list when they become available, generally 3-4 weeks after the second installment due date. You are required to have your Tax Buyer Registration form on file in our office, 10 business days prior to the tax sale. For this year’s sale, all Tax Buyer Registration forms must be turned in to the Treasurer’s office by October 11, 2019. 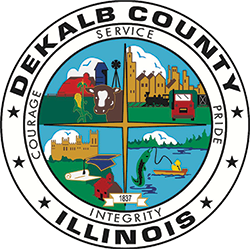 Please use our DeKalb County Tax Buyer Registration form, which you can request by calling our office at 815-895-7112. Your registration must be accompanied by a $500.00 deposit which will be applied to your purchases at the sale. It may also be refunded if you attend the sale, but do not purchase any taxes. Your deposit will be forfeited if you do not attend the sale. One buyer per registration will be allowed to bid at the tax sale. Certified funds are required for first-time buyers. If you are not a first-time buyer, personal, business or cashier’s checks are accepted. Taxes must be paid immediately after the close of the tax sale. All of the liens are sold at the tax sale. 8. Will the tax sale be final? 9. Do you have any sales scheduled after the next one coming up? The tax sale only occurs once per year. 10. Can I bid without attending (via mail, or a representative)? You or your registered representative must be physically present at the sale to bid. You cannot bid via mail. The sale will be conducted in an open outcry format. 11. Can you provide me with a list of property use codes? The Chief County Assessments office can assist you with property use codes. 12. If I end up with a property, does the county handle the foreclosure process? It is the tax buyer’s responsibility to follow the procedures necessary to acquire a deed. 13. Will all other liens be cleared from the property as a result of the sale? No, the tax sale does not clear any liens from the property. 14. Is a copy of the state statutes regarding the tax sale available for purchase? The tax sale is governed by the Illinois Compiled Statutes which are available at your local library, or online. 15. Where do I call for redemption information? For redemption information, please contact the DeKalb County Clerk’s office at 815-895-7149.